Caribbean immigrants have been contributing to the well-being of American society since its founding. Alexander Hamilton, the First Secretary of the Treasury was from the Caribbean island of St. Kitts. We count among our famous sons and daughters, Secretary of State Colin Powell, Cicely Tyson, WEB Dubois, James Weldon Johnson, Harry Belafonte and Sidney Poitier to name a few. The Festival will bring together not just the English and French speaking Caribbean Islands, but it will bring to the main stage, groups representing all four Spanish Caribbean Islands (Cuba, Dominican Republic, Puerto Rico, and Panama. The Festival has a uniquely Caribbean flavor as our audience will be serenaded by distinctive Caribbean bands: Reggae, Soca and Merengue Latin-Pop. The Festival at Jones Plaza features many vendor booths and also features different types of Caribbean cuisine including Pelau (Peas & Rice), Jerk Chicken, Bake & Saltfish (sandwiches) and traditional drinks including Sorrel, Mauby (a drink made from the bitter bark of a tree and sweetened with lots of sugar), Squash (made with limes and banana essence), Roti (curry chicken, or beef with potatoes wrapped in a curry flavored flour shell). A three hour block of time is set aside for displays of culture such as poetry, singing, dancing, dramatic readings and interpretations of works by Caribbean authors and storytelling which is a tradition by which the members of the Caribbean community—young and old—passes on stories and history and traditions of the culture by the telling of personal stories and experience, legends and folklore. 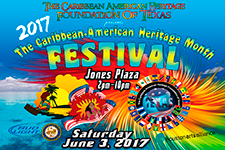 Several cultural groups performed at The Festival as well and they include: Adrenaline Carnival Mas Band; the Dominican Republic dance group Raices Dominicans; Dominican Republic recording artist, Yamilka G; Bahamas recording Artist, Khiara; Cuban Dance Group Doble Opcion; Puerto Rican Artist Anthony T; Reggaeton Group Klandestino; Trinidad and Tobago Recording Artists T-Rock and Shanade; Dominica’s Kubuli Dancers; Texas Steel Pan Orchestra; Grupo Folklorico Raices de Panama - Folk Dance Group of Panama; Music courtesy of Island Vybz Radio and much more.